UNICEF is responsible for 7 global SDG (Sustainable Development Goals) indicators and co-custodian for a further 10. In this role, UNICEF supports countries in generating, analyzing and using data for these indicators for all their citizens. This includes leading methodological work, developing international standards, and establishing mechanisms for the compilation and verification of national data, and maintaining global databases. The SDGs are universal in scope, and their call to leave no one behind puts the world’s most vulnerable and marginalized people – including children – at the top of the agenda. But two years since world leaders committed to achieving the SDGs, are we on track to achieve the goals for children? Do we even have enough information to know? The 2030 Agenda includes 17 Global Goals addressing the social, economic and environmental dimensions of sustainable development. Attached to the Goals are 169 concrete targets measured by 232 specific indicators. 35 of these indicators are directly related to children. Most countries have insufficient data to assess whether they are on track to achieve the SDG targets for children. Available data show an alarming number of countries needing to speed up progress to reach global targets. or – often – adolescent girls. UNICEF, as the global leader of data for children, is the custodian for 7 global SDG indicators and co-custodian for a further 10 indicators. 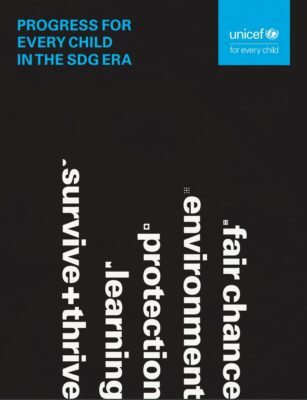 The first comprehensive assessment on progress towards achieving the global SDG targets for children, Progress for Every Child in the SDG Era assesses the world’s performance on the SDGs to date, focusing on 44 indicators that directly concern 2030’s most important constituency: children. The analysis reveals that most countries have insufficient data to assess whether they are on track to achieve each of the SDG targets, and where data are available, an astounding number of countries need to speed up progress. UNICEF’S commitment to data for children is guided by the fact that the SDGs impact every aspect of a child’s well-being. This human rights based approach pursues a vision of realizing the rights of every child, especially the most disadvantaged and responds to the call to “leave no child behind”, so that the rights of every child, everywhere, will be fulfilled. The table below lists the SDG indicators that have been identified by UNICEF, based on these broad areas, as most relevant for monitoring the situation of children under each SDG goal.